In January, I visited the Center for Human Molecular Biology & Genetics at the Sichuan Academy of Medical Sciences & Sichuan Provincial People’s Hospital, Chengdu, China [Chinese website of the Institute]. It is a large provincial hospital in Sichuan Province with a population of 80.8 million. The hospital served approximately 3.6 million outpatient and emergency cases, and carried out almost 75,000 surgeries in 2011. With this number of patients, the Center for Human Molecular Biology & Genetics collected extensive human samples and has been a leader in genetics study in China. Prof. Zhengli Yang, the vice president of the hospital and the director of Center for Human Molecular Biology & Genetics, invited both me and a renowned eye geneticist Prof. Shomi Bhattacharya to discuss our current research on eye disease therapy. I discussed how my lab is setting up the foundation to use zebrafish to screen eye drugs at Purdue. Prof. Bhattacharya discussed his work on gene therapy and stem cell therapy. It was a great experience to interact with a world leader in genetics whom discovered many of the key genes in retinal degeneration, and a top notch research institution in China. 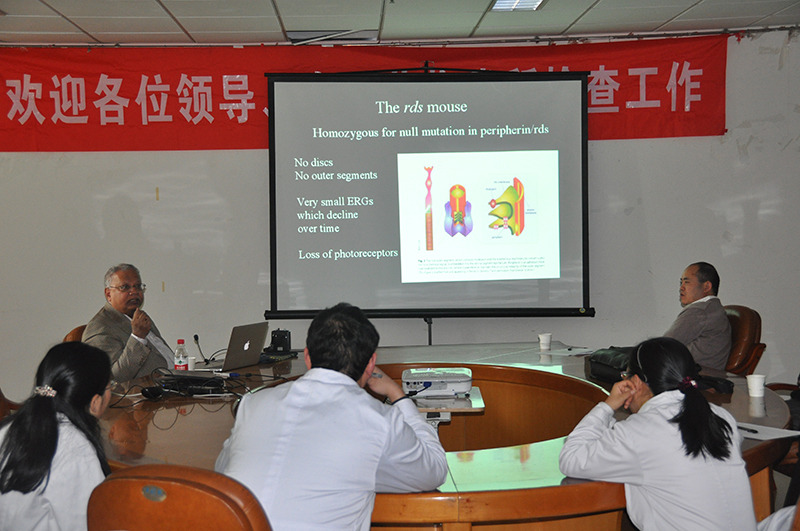 Prof. Shomi Bhattacharya lectured at the Center for Human Molecular Biology & Genetics, the Sichuan Academy of Medical Sciences & Sichuan Provincial People’s Hospital, Chengdu, China. 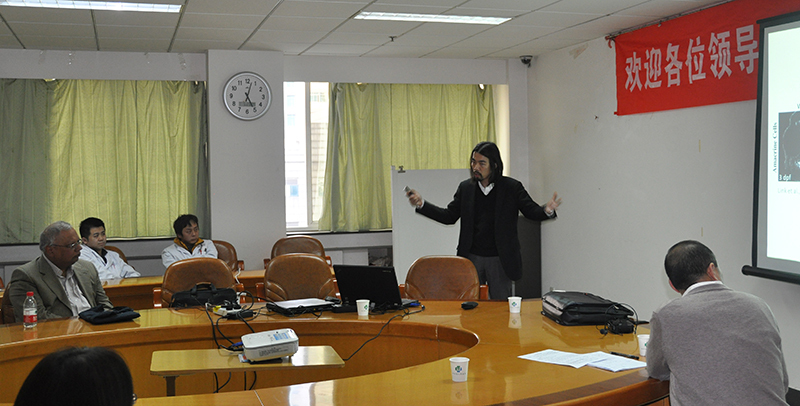 Prof. Zhenglin Yang (right) hosted the symposium. 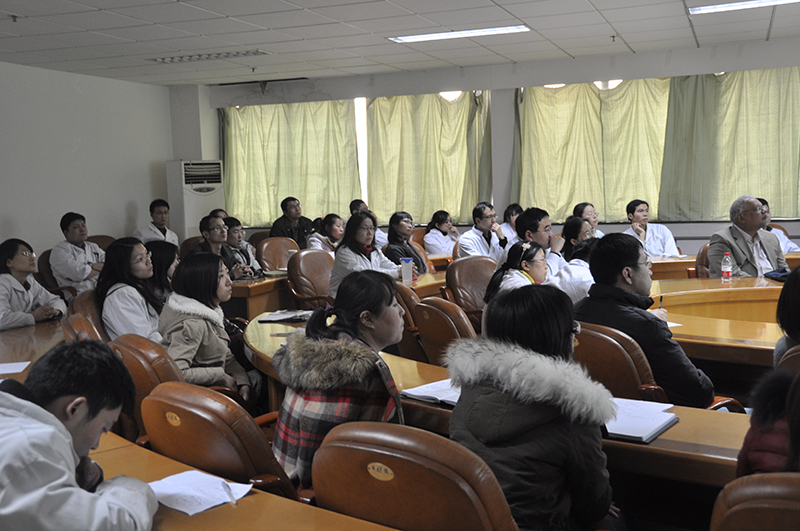 Audience from the Center for Human Molecular Biology & Genetics, the Sichuan Academy of Medical Sciences & Sichuan Provincial People’s Hospital, Chengdu, China. Posted by Yuk Fai Leung on February 18, 2014 at 11:25 PM under Fai's sharing. Cai D, Cohen KB, Luo T, Lichtman JW, Sanes JR. Improved tools for the Brainbow toolbox. Nat Methods. 2013 May 5;10(6):540-7. doi: 10.1038/nmeth.2450. Epub 2013 May 5. PubMed PMID: 23817127. Pan YA, Freundlich T, Weissman TA, Schoppik D, Wang XC, Zimmerman S, Ciruna B, Sanes JR, Lichtman JW, Schier AF. Zebrabow: multispectral cell labeling for cell tracing and lineage analysis in zebrafish. Development. 2013 Jul;140(13):2835-46. doi: 10.1242/dev.094631. PubMed PMID: 23757414; PubMed Central PMCID: PMC3678346. Blog post by the first author: Red fish, blue fish, Brainbow fish! Berger W, Kloeckener-Gruissem B, Neidhardt J. The molecular basis of human retinal and vitreoretinal diseases. Prog Retin Eye Res. 2010 Sep;29(5):335-75. doi: 10.1016/j.preteyeres.2010.03.004. Epub 2010 Mar 31. Review. PubMed PMID: 20362068. Dalkara D, Byrne LC, Klimczak RR, Visel M, Yin L, Merigan WH, Flannery JG, Schaffer DV. In vivo-directed evolution of a new adeno-associated virus for therapeutic outer retinal gene delivery from the vitreous. Sci Transl Med. 2013 Jun 12;5(189):189ra76. doi: 10.1126/scitranslmed.3005708. PubMed PMID: 23761039. News coverage: Genes Get in Your Eye. Qi LS, Larson MH, Gilbert LA, Doudna JA, Weissman JS, Arkin AP, Lim WA. Repurposing CRISPR as an RNA-guided platform for sequence-specific control of gene expression. Cell. 2013 Feb 28;152(5):1173-83. doi: 10.1016/j.cell.2013.02.022. PubMed PMID: 23452860; PubMed Central PMCID:PMC3664290. Jinek M, Chylinski K, Fonfara I, Hauer M, Doudna JA, Charpentier E. A programmable dual-RNA-guided DNA endonuclease in adaptive bacterial immunity. Science. 2012 Aug 17;337(6096):816-21. doi: 10.1126/science.1225829. Epub 2012 Jun 28. PubMed PMID: 22745249. Horvath P, Barrangou R. CRISPR/Cas, the immune system of bacteria and archaea. Science. 2010 Jan 8;327(5962):167-70. doi: 10.1126/science.1179555. Review. PubMed PMID: 20056882. Sampson TR, Saroj SD, Llewellyn AC, Tzeng YL, Weiss DS. A CRISPR/Cas system mediates bacterial innate immune evasion and virulence. Nature. 2013 May 9;497(7448):254-7. doi: 10.1038/nature12048. Epub 2013 Apr 14. PubMed PMID: 23584588; PubMed Central PMCID: PMC3651764. Ma AC, Lee HB, Clark KJ, Ekker SC. High Efficiency In Vivo Genome Engineering with a Simplified 15-RVD GoldyTALEN Design. PLoS One. 2013 May 29;8(5):e65259.doi: 10.1371/journal.pone.0065259. Print 2013. PubMed PMID: 23734242. Lim S, Wang Y, Yu X, Huang Y, Featherstone MS, Sampath K. A simple strategy for heritable chromosomal deletions in zebrafish via the combinatorial action of targeting nucleases. Genome Biol. 2013 Jul 1;14(7):R69. [Epub ahead of print] PubMed PMID: 23815890. Fortin JM, Currie DJ. Big Science vs. Little Science: How Scientific Impact Scales with Funding. PLoS One. 2013 Jun 19;8(6):e65263. Print 2013. PubMed PMID: 23840323; PubMed Central PMCID: PMC3686789. Biesecker LG. Hypothesis-generating research and predictive medicine. Genome Res. 2013 Jul;23(7):1051-3. doi: 10.1101/gr.157826.113. PubMed PMID: 23817045; PubMed Central PMCID: PMC3698497. Posted by Yuk Fai Leung on July 13, 2013 at 5:14 PM under journal watch. Cideciyan AV, Jacobson SG, Beltran WA, Sumaroka A, Swider M, Iwabe S, Roman AJ, Olivares MB, Schwartz SB, Komáromy AM, Hauswirth WW, Aguirre GD. Human retinal gene therapy for Leber congenital amaurosis shows advancing retinal degeneration despite enduring visual improvement. Proc Natl Acad Sci U S A. 2013 Jan 22. [Epub ahead of print] PubMed PMID: 23341635. News coverage: Another Bump in the Road to Gene Therapy? Muto A, Ohkura M, Abe G, Nakai J, Kawakami K. Real-Time Visualization of Neuronal Activity during Perception. Curr Biol. 2013 Jan 29. doi:pii: S0960-9822(13)00002-X. 10.1016/j.cub.2012.12.040. [Epub ahead of print] PubMed PMID: 23375894. Hwang WY, Fu Y, Reyon D, Maeder ML, Tsai SQ, Sander JD, Peterson RT, Yeh JR, Joung JK. Efficient genome editing in zebrafish using a CRISPR-Cas system. Nat Biotechnol. 2013 Jan 29. doi: 10.1038/nbt.2501. [Epub ahead of print] PubMed PMID: 23360964. Bedell VM, Wang Y, Campbell JM, Poshusta TL, Starker CG, Krug RG 2nd, Tan W, Penheiter SG, Ma AC, Leung AY, Fahrenkrug SC, Carlson DF, Voytas DF, Clark KJ, Essner JJ, Ekker SC. In vivo genome editing using a high-efficiency TALEN system. Nature. 2012 Nov 1;491(7422):114-8. doi: 10.1038/nature11537. Epub 2012 Sep 23. PubMed PMID: 23000899; PubMed Central PMCID: PMC3491146. Posted by Yuk Fai Leung on February 10, 2013 at 4:14 PM under journal watch.